Hvosting Review 2019: Is Hvosting a Good Hosting? Established in 2002, Hvosting is a website hosting provider based in Ukraine. The company specializes in the provision of shared hosting, VPS, and dedicated server solutions to small and medium-sized businesses. Hvosting is a web hosting vendor based in Ukraine. The company was founded in 2002 as a hosting provider for shared web hosting, dedicated servers, and VPS server solutions. The vendor also provides domain name registration services. It targets small and medium-sized businesses in Ukraine but also has a notable presence in Russia, the U.S., and Belarus. 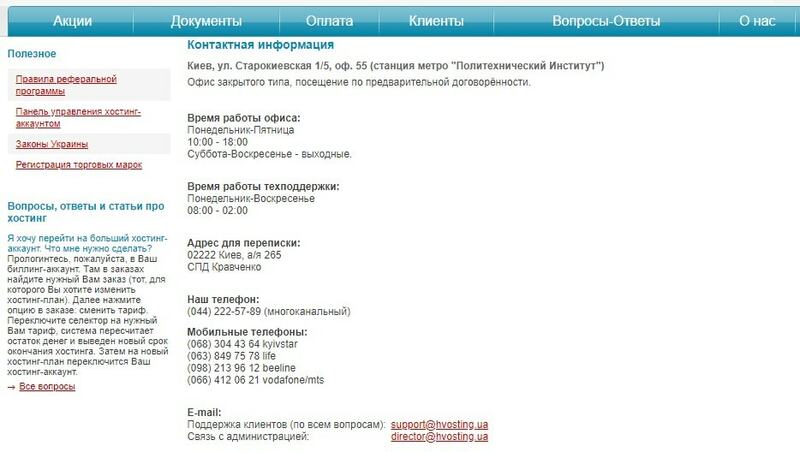 The Hvosting website is available in Ukrainian. Hvosting hosting services are hosted in modern data centers located in Kiev, Ukraine, which are TIER III compliant. They are connected to a fast backbone network of up to 20 Gbit/s. What’s more, Hvosting uses high-end hardware to deliver stable and reliable hosting solutions. Each of its servers is RAID 10 protected and powered by Intel Xeon processors. Unlike the shared hosting solutions that most vendors offer, this vendor employs isolation protocols to ensure that resource hungry websites do not affect other websites hosted on the same server. The vendor provides backup solutions for their clients. It performs backups every day and stores copies for the last 30 days. Users can restore the files in bulk or individually. In addition, Hvosting hosting solutions support Python, one of the most advanced programming languages. WordPress, Joomla, and other CMS users will be delighted to learn that the vendor’s hosting solutions are specially tuned for top content management systems. Unfortunately, none of this vendor’s packages include SSL certificates, even as an add-on. The vendor uses ISPmanager which, while easy to use, can still present a challenge to users used to popular control panels like cPanel. The Hvosting website is unappealing and poorly organized. Hvosting has found a way to deliver pocket-friendly hosting plans packed with high-quality features with few limitations. The vendor has adopted a straightforward pricing model with a monthly billing cycle and apparently no extra or hidden charges. Prices are listed in Ukrainian hryvnia. The vendor offers free installation as well as free traffic for all its hosting packages. That said, Hvosting does not have a refund policy or any uptime network guarantee for its services. You can reach Hvosting via telephone and email. Unfortunately, these are the only two means you can use to contact them; there is no live chat or ticketing system. With such limited means to contact this vendor, it is not surprising that it doesn’t have round the clock support. Yet, the support team’s responsiveness is noteworthy. Depending on the complexity of the issue and workload of the department, the vendor says it takes the support team between two hours and 12 hours to respond to customer queries. However, I got a response to my email in less than 45 minutes from the moment I sent it out. All the same, the vendor has yet to put up a knowledge base and the available FAQ section hardly answers many of the questions webmasters would typically have about a vendor’s hosting solutions. 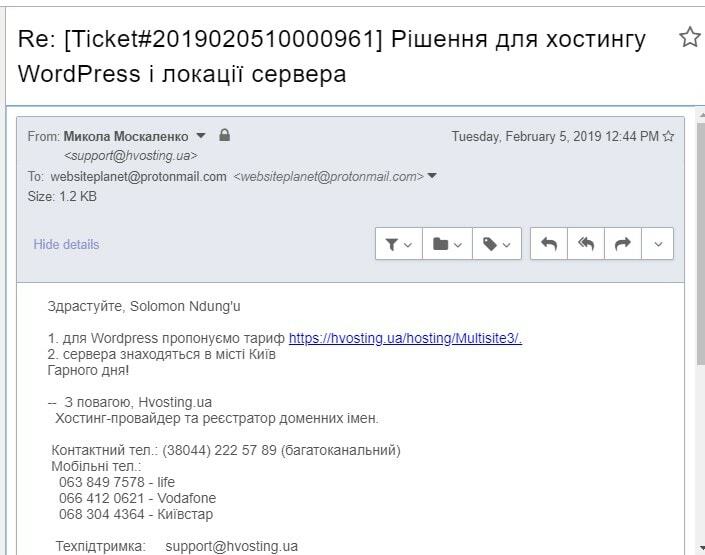 While Hvosting hosting solutions are unsuitable for large business enterprises, it is without a doubt reliable and satisfactory for small businesses based in Ukraine. What’s more, the highly responsive support team endears it to many SMEs in Ukraine and beyond. Wondering how Hvosting stacks up against other Web Hosting companies? Enter any other Web Hosting company and we will give you a side-by-side comparison.